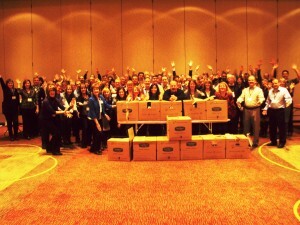 80 members of the CUNA Select Leadership Team came together in Dallas, Texas for an Ace Race Golf Team Building Event. The opportunity was a great experience for team building, fun, friendly competition, and to donate food to the Mission Central Food Pantry. Everyone had fun designing a miniature golf hole and then competing to make an “Ace” (hole-in-one) at each hole. The twelve hole course made with mats of felt for the green and non-perishable food items to construct the holes and obstacles provided a challenge and fun to all of the participants. The fun and learning culminated in all of the food items being donated to the Mission Central Food Pantry. There was learning, fun and a great feeling when a representative of the food pantry explained how the food would be used and the tremendous difference it would make in the lives of individuals. Thanks CUNA for a great event and for making a significant contribution to the Mission Central Food Bank. May the Ace Race experience benefit you as your gracious gift to the food pantry will benefit so many in need.